Isidore of Seville (599-636) wrote probably the most famous and important encyclopaedia of the Middle Ages, the 'Etymologies', named after one of its constituent chapters. It is a compilation of all the knowledge that was available to Isidore, from a wide variety of sources. 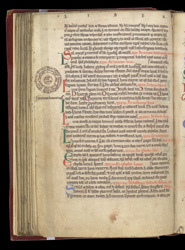 This manuscript has a 13th- or 14th-century flyleaf inscription stating that it belonged to the priory at Horsham St. Faith, Norfolk. His marginal diagram is next to passages concerning the course of the sun through the sky, and the light of the moon.